Mention the idea of a youthful “Reggae Revival” to any of Jamaica’s preceding generations of roots artists and the response is invariably “How can you revive what is not dead?” For these dogged exponents and exporters of the craft to the world, the last few years have not been so much a revival as a reggae vindication. Take Luciano who, following a series of scandals in 2009, seemed to undergo a rejuvenation of his own - releasing a string of critically acclaimed albums with European and American producers that began with Frenchie’s United States of Africa. Yet whether by chance or by design, 2013 sees the Guinness-rich voiced singer back with an album whose principal helmer is a Jamaican. Al.Ta.Fa.An’s Anthony Senior is another seasoned roots stickler who this year already put out Junior Kelly’s excellent if, in places, reheated singles recap Piece Of The Pie. As you’d expect from Senior’s past releases the music is gratifyingly live instrument based with a bag of guests spanning the ages. 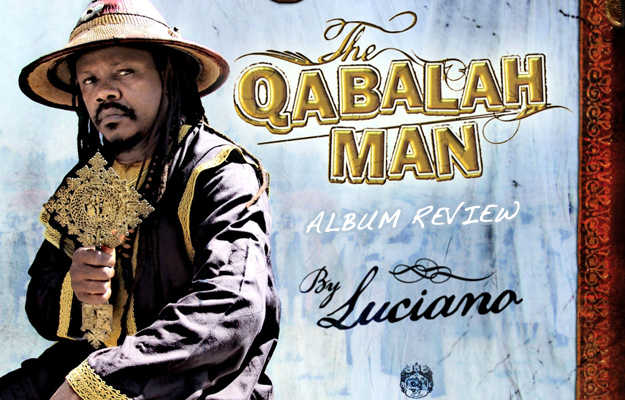 The new record’s title is inspired by Luciano’s interest in the Kabbalah philosophy which stresses balancing mind and matter (you may recall Qabalah is also the name of the indie label he started in the 90s with Mikey General). Seven of the fourteen tracks are produced by Senior and feature Luci’s old touring band from the Fatis Burell days, the Firehouse Crew. The remainder are split between Germany’s Oneness Records, Gentleman’s drummer Josi “Big Fingah” Coppolla, Michael Edgehill AKA the artist Mikey Melody and Soljie Hamilton – the man who gave Senior his start as a youth. Some of the content will be familiar to singles buyers. Thunderous opening duet with Bob Andy, Create Our History – penned by the Studio 1 songwriter himself - saw the light on 2008’s Al.Ta.Fa.An compilation Jamaican Rebel Sound Volume 1. Oneness’ Weapons Of War was out on 7” in 2010 while the drum-free So Long with Mark Wonder appeared on the latter’s collection True Stories Of Mark Wonder and Friends. Most of the songs are fresh however (and lest we forget - United States of Africa, Luci’s highest regarded album of late was also bolstered by a few older songs in this way). The venerable U Roy’s contribution is matched by Statian firebrand Ziggi on the 70s rockers style Organise (which reprises in dub). Luciano has a good stab at deejaying too on Material World - a moody minor key stalker decrying the lascivious abandon of Babylon. But the more numerous major key offerings continue his welcome trend towards lyrics with real bite. Against a dreamy mystical backdrop Don’t Sell Out warns Africans that external pressure to industrialise comes from the “descendants of backra masters”. Luci’s idol Dennis Brown gets a tribute on the Real Rock rhythm featuring Brazil’s Dubiterian on melodica. The only odd choice is Skull And Bone on Edgehill’s relick of the Gunshot – whose digital feel doesn’t quite fit with the rest. No post Fatis Luciano album will ever please the “90s were better” crowd who seem to get more vocal with age. But this is another solid chapter in the veteran’s renaissance exemplified by United States of Africa, Write My Name, and Rub-A-Dub Market. Moreover, this one is all the sweeter for being at least 50% produced by a Jamaican who was making real reggae long before the hype about revival. With a Mad Professor long-player ready for release and Luci’s own Dennis Brown covers project Honour to the King planned for early 2014, there could be further good roots music from “the messenger” to come.